Werlatone now offers a Directional Coupler, covering the full 500-4000 MHz band, Model C9721. This 40 dB design is rated at 300 W CW, operates with an Insertion Loss of 0.2 dB Max., and measures just 3 x 3 x 1.09". A 700-3800 MHz, 250 W CW design is also available, the Model C8698. 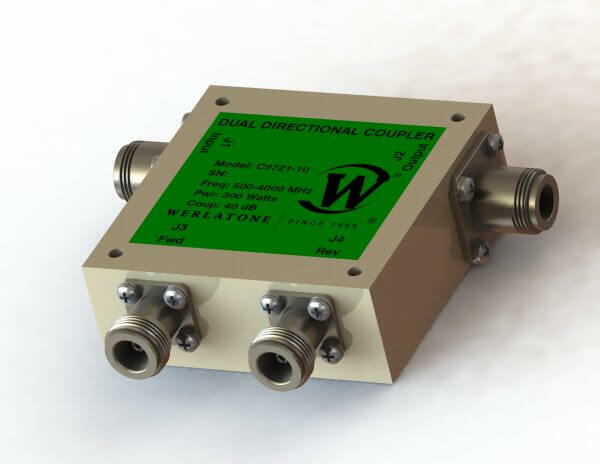 Werlatone now offers a Directional Coupler, covering the full 500-4000 MHz band, Model C9721. This 40 dB design is rated at 300 W CW, operates with an Insertion Loss of 0.2 dB Max., and measures just 3 x 3 x 1.09″. A 700-3800 MHz, 250 W CW design is also available, the Model C8698.